Insidious is a favorite horror series scaring kids and adults alike and unlike some long series it's storyline is one of the best and doesn't leave someone confused or have any plot holes needing to be filled. The Insidious franchise as a whole is very interesting and worth watching. If you don't know what is going on, Insidious Chapter 3 is actually a prequel to the first and follows the psychic Elise Rainer (Lin Shaye) before she meets her demise at the end of the first movie. At first, Elise is trying to not use her gift because of personal reasons but a young teenager by the name of Quinn Brenner (Stefanie Scott) seeks her out for help. After Elise refuses, Quinn is then haunted by some unknown entity. She believes it's someone close to her but in fact it's an evil soul-stealing demon. That's when Insidious Chapter 3 makes you either scream, jump or even close your eyes, just like scary movies are supposed to do. 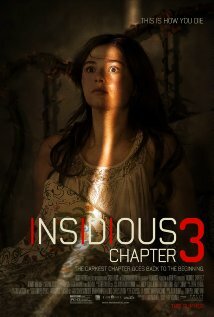 Insidious Chapter 3 explores going to the "Further," the realm where evil lurks in the shadows, lost souls who didn't make it to the light. Those that are still living have an advantage when they are in that realm and can kick some major trash just by standing up to that evil. Sounds like out of the top but you'll understand what I mean if you've seen the previous two or if you go see this one. Elise is a fighter in this one and although she is fighting to keep an evil spirit away she comes through for Quinn's sake and fights off her tormentor. The ending is really touching. Even though there is evil there is always good to overcome the darkness. You"ll see what I mean when you watch it. Again, what kept me in the Insidious series is the storyline — it connects smoothly so don't miss out on seeing this flick.